Explanation: Located 20,000 light-years away in the constellation Carina, the young cluster and starforming region Westerlund 2 fills this cosmic scene. Captured with Hubble's cameras in near-infrared and visible light, the stunning image is a celebration of the 25th anniversary of the launch of the Hubble Space Telescope on April 24, 1990. The cluster's dense concentration of luminous, massive stars is about 10 light-years across. Strong winds and radiation from those massive young stars have sculpted and shaped the region's gas and dust, into starforming pillars that point back to the central cluster. Red dots surrounding the bright stars are the cluster's faint newborn stars, still within their natal gas and dust cocoons. 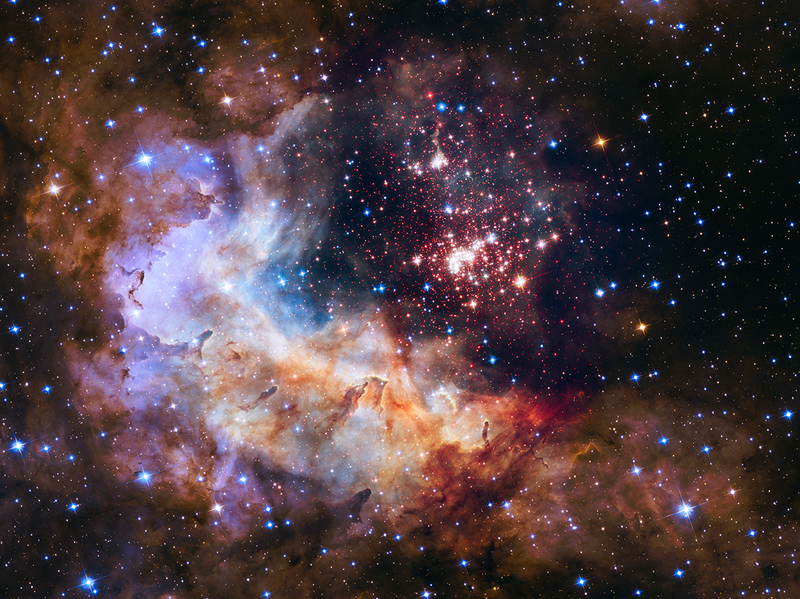 But brighter blue stars scattered around are likely not in the Westerlund 2 cluster and instead lie in the foreground of the Hubble anniversary field of view.